There’s something about starting a new year that makes everyone feel like they have a clean slate. When it comes to finances, this clean slate can be invaluable. Perhaps 2015 was a rough financial year for you. You may have found yourself in several predicaments that wreaked havoc on your finances, or perhaps you continued with the same bad money habits that have plagued you your entire adult life. Whatever the reason, you’ve decided that 2016 is going to be the year that you take control of your finances and get your life back on track. If you’re serious about getting your finances in order in 2016, here are five financial goals for the new year to get you on the right track. Do you know where your money is going? Creating a budget is imperative to get yourself on the right financial path. Check out this post on how to create a monthly budget in five steps so you can begin planning. You may only have a few hundred on your credit cards, or you may be drowning in debt. Whatever your financial standing may be, it’s important that in 2016 you have a plan to pay off your debt. You may not pay it all off, but having a plan and making progress toward paying off debt is important to get you one step closer to financial freedom. Check out our series on how to pay off debt for guidance along the way. Too often, we depend on our credit cards to bail us out of an emergency. To get out of this cycle of debt and despair, be proactive and create a $1,000 emergency fund. Implement your own rules and guidelines (i.e. only to be used for real emergencies, and not because there was a sale at the mall). Read this post on everything you need to know about emergency funds if you’re not totally familiar with the concept. No matter your age, if you’ve started working and aren’t saving for retirement, you’re already one step behind. You may think it’s impossible to save for retirement when you’re barely trying to get your immediate finances in order, but planning for the future is just as important. If the task of allocating any amount of money toward your retirement seems daunting, start small. Allocate $5 a week to a retirement account and increase the amount by $5 each month. And if your company offers any kind of company match on your 401(k), you should always match it no matter what—that’s free money they’re giving you! Read about taking charge of your retirement fund for steps you can take to secure your future. If you still find yourself struggling to make ends meet, and you’ve already cut out all the superfluous items from your budget, the only other option is to earn more money to help meet your financial goals. Check out three easy ways you can increase your income. 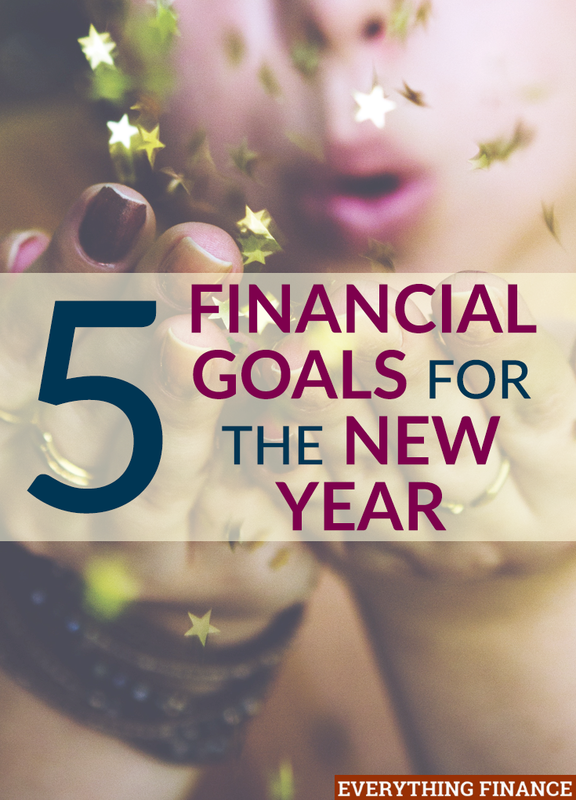 Make 2016 the year you get your finances on the right track and use these five money goals to help get you there. What financial goals are you planning on working toward next year? What goals did you accomplish this year?